Feng Shui is the Eastern practice of working with chi or the cosmic life force energy along with your desired intention to create a specific environment in your home and or work environment. One of the most popular reasons people use Feng Shui is to either bring in love or spice up their romantic relationships. 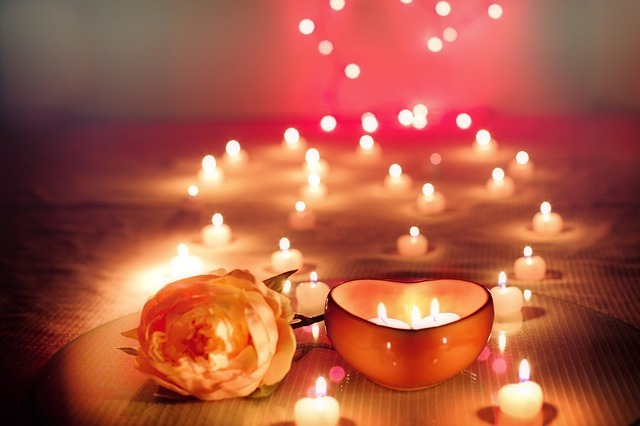 Burn pink, red and or white candles along with your intention. It is best to work with 2 candles at a time because we are working with relationships and traditionally a relationship is between 2 people. Place rose quartz in your bedroom and or relationship corner. The relationship corner of your home/space is in the far right hand corner of the dwelling. Rose quartz is pure love and vibrates at a high frequency. It is best to work with 2 rose quartzes instead of 1 because we are working with pairs ~ you and a partner. Create room for your partner in your bedroom and make sure there is enough closet space for them to make themselves cozy in the same home. If at all possible, decorate your bedroom and relationship corner with pairs of objects. An example of this would be lamps, photos, end tables etc. Make sure the photos in your bedroom are a representation of your vision of what a loving and balanced romantic relationship would look for you. Move the family photos that have children and parents into another part of your home. This one makes sense doesn’t it? We wouldn’t want them in this private area of our space would we? De-clutter both the bedroom and relationship corner in your home so that the chi flows freely and effectively. Ideally we would not want to have clutter in any area of our home however, the bedroom tends to collect clutter with clothes etc. Decorate your bedroom with inviting and warm colors with accents of reds, whites, greens and pinks and be sure to keep the bedding clean and crisp. Get rid of extra pillows and or stuffed animals on the bed. These objects are taking up space physically and energetically in your bed. Make room for your companion! Aromatherapy is a very effective approach to creating the ambiance of your choice. To bring romance and balance into your love life use oils such as; ylang ylang, jasmine, clary sage, geranium, rose, and cardamom. To keep your room smelling fantastic I suggest either using an oil diffuser or spraying a mist that has been blended for love. Limit amount of mirrors that you have in your bedroom and if at all possible, get rid of all mirrors. Mirrors deflect energy and will cancel out all of the Feng Shui cures you have been implementing into your bedroom. Take all work and fitness activities out of the bedroom and into another place in your home. These activities are energetically a romance blocker. The goal is to have your bedroom feel calm and relaxing, not busy. All of these Feng Shui tips will help you to create the energetic foundation that is welcoming a healthy, harmonic, and loving relationship into your life. Don’t forget to do your part by tending to what is going on within you so that you are emotionally, mentally, physically, and spiritually ready for your ideal relationship. It is important that we are the partner that we desire for ourselves.